THE GALLOWAY CUP WILL BE PLAYED THIS YEAR ON THE 20th JUNE. The Galloway Cup was won by Wigtownshire by 153 shots to 132. Castle Kennedy were the highest up rink and they were presented with the cup by Stewartry President Ben Herries. on Wednesday 1st JUNE is as follows. 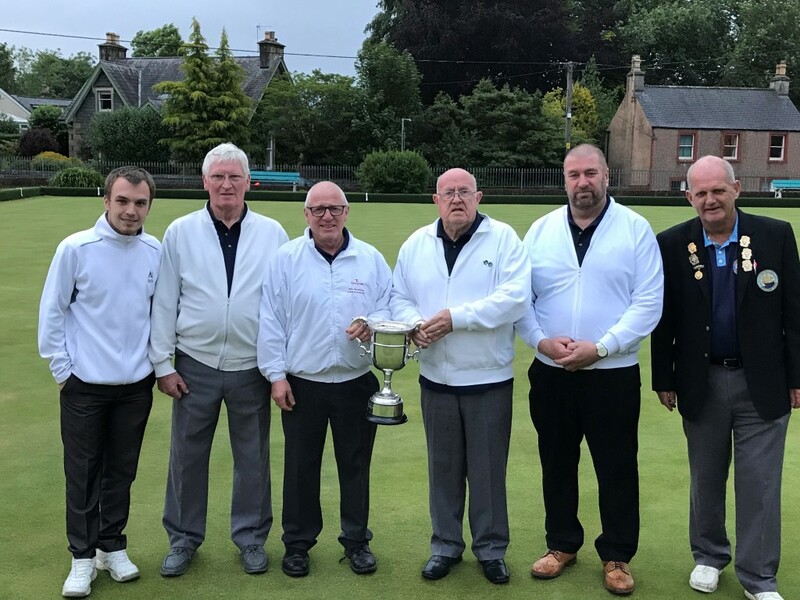 The Kirkcolm rink Bobby McKie, Sean McGaw, Bryce Greenhill & David McCurdy were the highest up rink for Wigtownshire and were presented the Galloway Cup by Stewartry President Scott McCubbin. Wigtownshire win the Galloway Cup. The Cup was presented to the Wigtown (highest up) rink of Malcolm Heron, David Bark, Douglas Bark Jr. & John Milligan by Stewartry President Murray Cairnie. ALL GAMES @ 6.30pm. 15 ENDS + 1 TRIAL. MEAL @ KIRKCUDBRIGHT CLUBHOUSE AT 9.15pm APPROX, COST £5 PER HEAD. Kirkcowan, the highest up rink in the Wigtownshire team were presented with the Galloway Cup by Stewartry Secretary Graeme Maxwell. The Stewartry won the Galloway Cup tonight by a 5 shot margin. At Kirkcudbright it was Stewartry 90 - Wigtownshire 82 and at Gatehouse it was Stewartry 86 - Wigtownshire 89, giving an overall score of Stewartry 176 - Wigtownshire 171. The highest up rink on the Stewartry side was for the second year Castle Douglas.